BMW Williams Ladies Top - ''Pole Position'' - REDUCED ! << Back BMW Williams Ladies Top - ''Pole Position'' - REDUCED ! BMW Williams F1 Ladies Top ''Pole Position''. 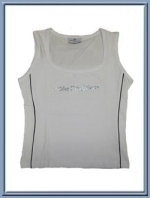 Fashionable, white, ladies top with horizontal "Pole Position" script on the chest, made out of strass stones. This is of course official BMW Williams merchandise.